By purposely not creating a formal, hierarchical organization with rules and dues and structure and charismatic leaders and spokespeople—all the things their parents told them they would need in order to get anything done—this new way allowed people from all over the country to feel like they were part of the rebellion by simply deciding that they were part of the rebellion. You want to occupy your local bank—do it! You want to occupy your college board of trustees—done! You want to occupy Oakland or Cincinnati or Grass Valley—be our guest! This is your movement, and you can make it what you want it to be. In the old days, if you were starting a movement, you had to first educate the public about the problem you were trying to fix, and then you had to persuade them to join you. To move America toward a nonracist, nonsexist, nonhomophobic, peace-seeking nation took years—decades—and we’re still not there. But with Occupy Wall Street, you don’t have to convince the majority of Americans that greed rules Wall Street, that the banks have no one’s interests but their own at heart or that corporate America is out to squeeze every last bit of labor and wages out of everyone’s pocket. Everybody gets it. Even those who oppose it. The hardest part of this or any movement—building a majority—has already happened. The people are with us. So now what do we do? Here’s what we don’t do: don’t turn Occupy Wall Street into another bureaucratic, top-down organization. That will certainly kill it. Baby boomers who grew up working within traditional organizations need to calm down and not shoehorn this movement into the old paradigm of “Let’s elect people to office and then lobby them to pass good laws!” Let Occupy take its natural course. The candidates for office that we need are in this movement. (Are you one of them? Why not? Someone has to do it, and it would be better if it was you!) The laws that must be enacted to make this a more just nation will come in due time. And not ten years from now; some of this will happen this year. The leading candidate for Congress from my hometown of Flint, Michigan, has already taken a pledge to make “getting money out of politics” his top goal once in office. Others have joined him. We need to vote for them and then hold them to it. But right now, Occupy has to continue as a bold, in-your-face movement—occupying banks, corporate headquarters, board meetings, campuses and Wall Street itself. We need weekly—if not daily—nonviolent assaults right on Wall Street. You have no idea how many people across the country would come to New York City to participate in wave after wave of arrests as they/we attempt to shut down the murderous, thieving machine that is Wall Street. Forty-five thousand people a year die simply because they don’t have health insurance. Do you think they have any relatives, friends, neighbors, parishioners who might be a little upset? How about the 4 million people losing their homes to the banks? Or the millions of students being crushed by debt? I think we could organize a few of them to shut down Wall Street. And in town after town across America, people need to do similar things, but on a local level. Evictions of people who have been foreclosed upon must be met by citizens occupying the front door of the repossessed home and nonviolently blocking the bank from tossing the family out to the curb. When a neighbor can’t get the medical procedure she needs, people in town must occupy the hospital or the lobby of the insurance company. When a university raises students’ tuition for the umpteenth time, those students must occupy the administration’s office until the board of trustees relents. 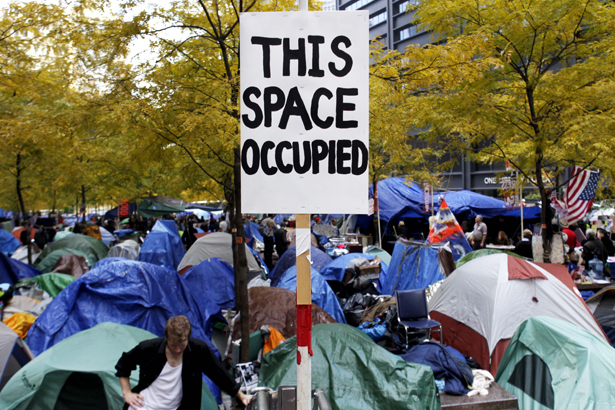 It’s important to remember, though, that Occupy Wall Street is about occupying Wall Street. The other Occupies that have sprung up around the country are in solidarity, and while they attack the tentacles and the symptoms of the beast that exist locally everywhere, the head can be chopped off only in one place—and that place is in downtown Manhattan, where this movement started and must continue. Our kids—the heart and soul of this movement—have watched us for years beating our heads against the walls of power, always marching on Washington, sending in checks to the environmental groups, giving up red meat—and what they got from this is that they are the first generation who will now be worse off than their parents. They still love us (which is remarkable when you think of the world we’ve handed them), but they are taking a different path from ours. Let them. The kids are all right. Do they know where their path will lead? Not necessarily—but that’s the beauty of Occupy Wall Street. The mystery of what’s ahead is the lure. Millions want in on that adventure because, deep down, they know they have no choice. And they know that there’s more of them than the men on Wall Street who currently occupy America. They have no choice but to win.